Boston Dynamics, the high-profile robotics company that Alphabet reportedly doesn’t want, has released a video of its latest robot: SpotMini. SpotMini is a four-legged robot that weighs just 55lbs and has an all-electric locomotion system. SpotMini is one of the quietest robots Boston Dynamics has ever built. In the past, the company has used gas engines and hydraulics in its robots, making loud, outdoor-only bots that sound like dirtbikes or chainsaws. 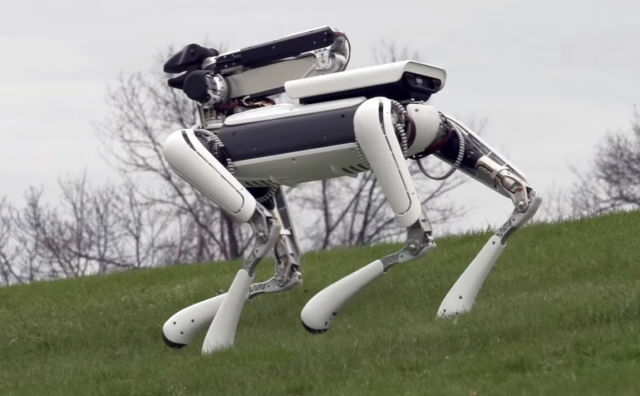 Boston Dynamics’ Alphadog was a much larger four-legged robot, but it was deemed too loud by the US Marines when they tested it as a pack mule last year. The goal with the SpotMini seems to have been to build a robot quiet enough, small enough, and clean enough that it can be used as a house robot. The robot is shown indoors walking up steps and ducking under tables. It even has an attachable arm that lets it do useful things like fetching a soda or cleaning the dishes (well, moving a dish from the sink to the washing machine, but that’s a start!). In typical Boston Dynamics’ tradition, the company also abuses the robot a bit, throwing a few banana peels in its way. The bot slips and goes down hard, slamming all 55lbs of metal into the hardwood floor without any attempt to break its fall. It’s fine afterward, though (we doubt the same can be said of the floor)—SpotMini just lifts itself up with its attached arm and goes on its way. A plastic-clad version of the SpotMini. One of the more interesting clips comes near the end, when a plastic-clad version of the SpotMini is shown. The plastic SpotMini looks less like a Frankensteined-together industrial robot and more like a consumer product someone might want to buy one day. A robotics company needs to do more than make really cool YouTube videos, though, and Boston Dynamics is reportedly in big trouble with parent company Alphabet. Former Android CEO Andy Rubin brought Boston Dynamics and several other companies into Google/Alphabet with the intention of merging them all into a robotics division called “Replicant.” But when Rubin left Google, the division fell apart. According to a Bloomberg report, Boston Dynamics is now up for sale, and the whole robotics division might be in jeopardy. Toyota has reportedly stopped by to kick the tires on BD and make an offer, but as far as we know, Boston Dynamics is still an Alphabet company for now.